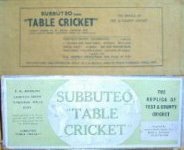 Subbuteo's other sports - Hockey, snooker, Angling; 1950s Racing Games - Speedway etc. This is a page about a range that I didn't think existed until recently. So many thanks to Stuart Smith for sending scans of the relevant price lists. In truth, this range was less interesting than the football lists of the era, because it was really just a chance to buy replacements for the box set. However, a pair of sightscreens do sneak onto the list later on. Unlike the football, or the later cricket accessories, there is no fancy numbering system here. The lists is just 1-12 (and later 1-14). Stuart kindly sent copies of two price lists - 1949 and 1961-62. So I've included the prices from both lists. Obviously being an era of minimal inflation, the costs didn't change much in these 12 years, with some prices even going down. The only prices to rise significantly were for the cloth pitches. 1. Complete game in box together with full assembling instructions, score sheets and Rules of play. This was the small "Popular" edition of the game. 2. 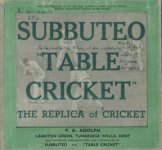 Complete game in box containing special fielding set (including bowler) and special batsmen and umpire set, stamped out in unbreakable celluloid material, together with score sheet and rules of play. 3. Fielding team sheet, including bowler, wicketkeeper and 9 fielder bases and 1 gummed identification sheet. The lovely card illustrated figures are slightly different than the celluloid ones. 4. Batsmen and umpire team sheet, including bats, together with bases. 5. Two Sets stumps, bails and rests. 9. Special batsman and umpire figures (including bats) stamped out in an unbreakable celluloid material. 10. Special fieldsmen figures including bowler, stamped out in an unbreakable celluloid material. Sets 11 and 12 consist of materials which have been specially selected as being the ideal surfaces on which to play the Subbuteo "table cricket" game. The "marked out" playing pitch (set 12) is a very handsome article. Why not ask your friends to go "SHARES" with you for one? 14. One bat with base. One bowler figure with base.